Yes, a Requiem Mass (Missa pro defunctis) can be said for the soul of a deceased person, and Requiem Masses needn't be accompanied by a funeral/burial. A Mass that includes your mother via Intentions for the Mass may fit your needs. One way to remember your mother in a Mass is to contact the local parish, or the parish where she passed away, and make a request that the intentions of the Mass include her by name. (Anecdote: we have done this a number of times in the past four years since the death of my father-in-law, in his home parish, most recently on the day before Thanksgiving this year.) You could also ask to have a private Mass for, celebrated with your family, but that requires coordination with a priest. The practice of praying for various individuals in the faith community is supported by a requirement from Canon Law. Whenever a priest celebrates Mass, he has at least two intentions. The first intention is to celebrate the Mass according to what the Church does. The second is to apply the grace of that Mass towards a specific need, whether it be a person(s), living or dead, baptized or not, or a special need. Every parish pastor is required, by Canon Law, to offer at least one Mass on Sunday for the needs and intentions of his parishioners (Can. 534 §1). Based on our family experience, you should contact your mother's parish, or your local parish, and ask to have her included in the intentions of a Mass that you will attend. Not the answer you're looking for? 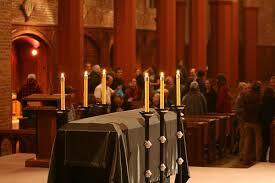 Browse other questions tagged catholicism mass funeral or ask your own question. In which denomination(s) are Christians allowed to bury and hold a Christian funeral for their deceased nonreligious or just non-Christian relative? What do Chinese Christians wear to a Western or Chinese Christian funeral?